Jack Welde, CEO of Smartling is here in Seattle to demo and discuss their translation delivery network and localization management system for software developers. The holy grail of translation for buyers is high quality, fast and affordable translation. Jack describes Smartling as an agile translation platform, in reference to agile software development. Traditionally, when you ask for fast, affordable and high quality, you can pick two. The agile development model seeks to deliver all three, with near real-time turnaround, smaller sets of content, many resources (in house, outsourced, and users) contributing to projects. With agile development, the goal is to build smaller features, publish more often, and refine the product via an iterative process. Smartling embraces this model with 25 full time developers, a 24/7 development schedule and over 400 software deployments per month. Where does translation fit into an agile process? Jack describes this as a five step process. Accept documents and content via highly automated channels, such as a web API. This means dealing with many file and document types: documents, localization files and structured content. The system then needs to parse these into the smallest linguistic units (sentences or small blocks of text that can be handled independently). Handle this content within a structured and disciplined workflow. If you have worked with a content management system like Drupal, you have already encountered this. This simply means having defined workflows for managing content, defined roles (translators, proof-readers, etc), and project/status tracking. Context also be delivered in context. One of the biggest challenges in translation and localization is context. If a text is sent for translation, for example a prompt from a mobile application’s user interface, but without context such as a screenshot, translators will often become confused. The result is “garbage in, garbage out”. Smartling’s solution to this is to use WYSIWYG (what you see is what you get) editing tools so that translators and reviewers edit translations, and see how they appear within the original web or mobile interface. This also allows them to see and correct problems with layout, for example when a long, compound German word breaks the layout of a style sheet. Use best practices with modern tools. Contributors must be able to edit content from web devices (any device, anywhere, including mobile devices). The platform should handle technical complexities (markup and patterns, such as date/time stamps for blog posts), and also linguistic complexities (rules for plural words in different languages, etc). Auto deploy completed translations. A key aspect of the agile process is continuous deployment. In traditional software development, products were released on a quarterly, yearly or even longer release cycle. Cloud based services, on the other hand, are updated continuously. 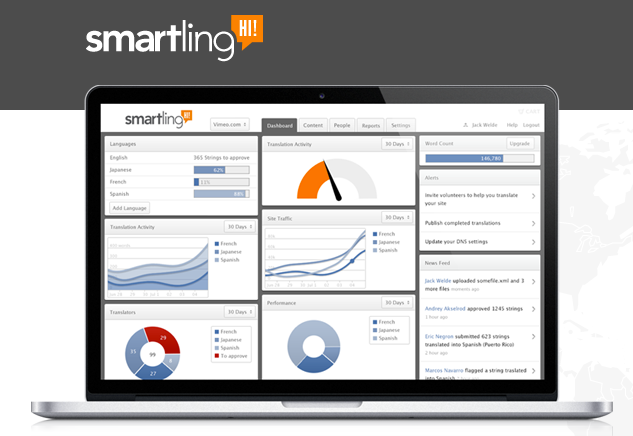 Smartling reports deploying 400 updates per month, from new features, to bugfixes. This allows services to adapt to customer feedback, and find/fix defects quickly. Agile translation seeks to do the same thing, by continually publishing translations as new context is published (for example, by auto-deploying translations to the customer’s content management system, source code repository, etc). Smartling has recruited some high profile customers, both startups and major brands. Among their early customers are Foursquare, Path, GoPro, and Vimeo (see complete list). The service is also integrated into content delivery networks such as Cloudflare, and currently serves over a billion translated pages per month. This entry was posted in crowd translation, game localization, hybrid translation, localization, machine translation, mobile app localization, translation delivery networks, translation management systems, website translation and tagged agile, foursquare, gopro, jack, localization, path, smartling, tdn, translation, vimeo, welde. Bookmark the permalink.